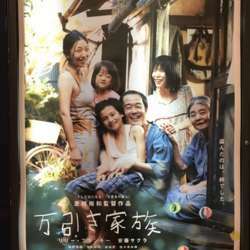 This movie, in English translated as "Shoplifters" will not be out for long. It has won the Palme d'Or. Also won three Mainichi Film Awards, including Best Film. Nominated for the Academy Award for Best Foreign Language film and nominated for the Golden Globe Award for Best Foreign Film. The plot: a humble Japanese family feels obliged to shop-lift to make ends meet. We can meet half an hour before the movie starts to have a drink in the cafe just opposite the cinema. I hope a few of you can make it!